Venezuelan President Nicolas Maduro was unharmed after an exploding drone "attack"
Caracas (AFP) - The United States on Sunday denied involvement as Nicolas Maduro blamed the opposition and Colombian counterpart Juan Manuel Santos for an alleged "assassination" attempt on the Venezuela president. Venezuela's far-left government said seven soldiers were wounded by the alleged attack using explosive-laden drones during a military parade in Caracas on Saturday. Maduro pointed the finger at outgoing Colombian President Santos and "the ultra-right wing," a term he uses to describe domestic opposition, as a mysterious rebel group claimed responsibility. US national security advisor John Bolton insisted there was "no US government involvement" and even suggested that the incident could have been "a pretext set up by the regime itself." Venezuela has already reacted to Saturday's events with a series of arrests as Attorney General Tarek William Saab, who was also present at the parade, warning: "There will be a ruthless punishment." "Justice! Maximum punishment! And there will be no forgiveness," he warned, sparking fears of an anti-opposition offensive in a country already reportedly holding some 248 political prisoners. "I am fine, I am alive, and after this attack I'm more determined than ever to follow the path of the revolution," added the successor to the late author of Venezuela's socialist revolution, Hugo Chavez. State television images showed Maduro looking up disconcertedly in the middle of a speech, having heard a bang, before members of the country's National Guard lined up in the parade suddenly scattered. "It was an attack to kill me, they tried to assassinate me," Maduro said. 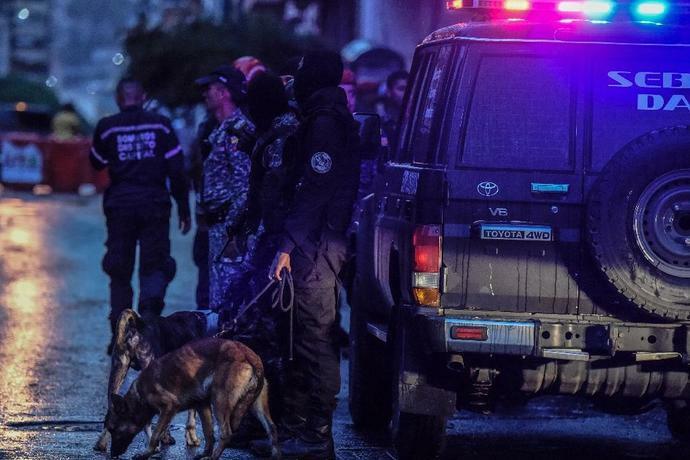 Communication Minister Jorge Rodriguez said there was "an explosive charge... detonated close to the presidential podium" and in several other spots along the parade held in central Caracas. Saab told CNN he saw a drone filming the event explode. Late on Saturday, a civilian and military rebel group calling itself the "National Movement of Soldiers in T-shirts" claimed responsibility in a statement passed to US-based opposition journalist Patricia Poleo, who read it on her YouTube channel. "We cannot tolerate that the population is suffering from hunger, that the sick do not have medicine, that the currency has no value, or that the education system neither educates nor teaches, only indoctrinating communism," said the statement, accusing the regime of having "made public office an obscene way to get rich." Maduro, though, blamed neighboring Colombia: "I have no doubt that the name Juan Manuel Santos is behind this attack." Santos, a Nobel Peace Prize winner who negotiated a historic peace accord with Marxist guerrillas FARC, is due to hand over power to the hardline right-wing Ivan Duque, a vocal critic of Venezuela's regime, on Tuesday. The Colombian foreign ministry denied involvement, saying the allegations were "absurd" and "lacked any foundation." Maduro said investigations pointed to financial backers who "live in the United States, in the state of Florida. I hope that President Donald Trump is ready to fight these terrorist groups." Speaking on "Fox News Sunday," Bolton said that if Venezuela had "hard information" of a potential violation of US law, "we will take a serious look at it." Elsewhere, Maduro's allies Cuba and Bolivia condemned the incident. In a statement, the Russia foreign ministry said: "We are convinced that settling political differences must be carried out exclusively in a peaceful and democratic way." Iran's foreign ministry decried "a step towards causing instability and insecurity in Venezuela," while Syria called for "respect of the country's sovereignty and no interference in its internal affairs." Maduro has remained in power in oil-rich Venezuela despite a collapsing economy and a long-running political crisis. Hundreds of thousands have fled due to food and medicine shortages and hyperinflation that could reach one million percent this year, according to the International Monetary Fund. 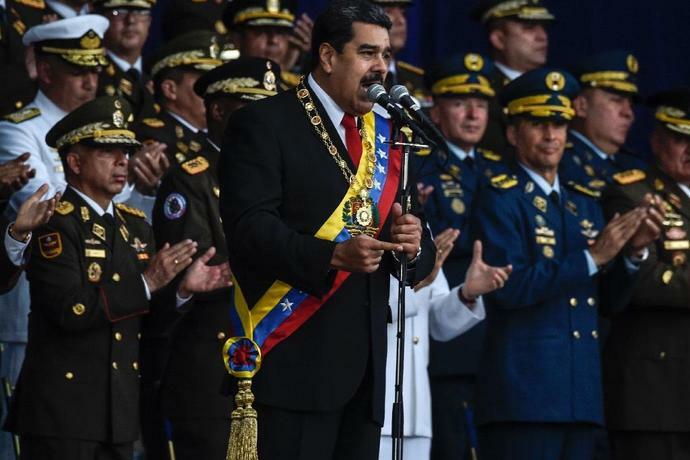 Maduro, a 55-year-old former bus driver, has effectively sidelined the fractured opposition through control of the courts and the electoral body -- and unstinting support from the military, which holds key posts in his government. After Saturday's explosion, he ordered the military to be on "maximum alert." This year he brought forward to May presidential elections -- boycotted by the opposition -- which handed him a new six-year term.